Newcomers to the comics in education movement are exposed to many misconceptions and misinterpretations. One such misunderstanding is the use of comics as a purely standalone endeavor, whereby the teacher carves out special time in which to expose students to comic literature. The if-we-have-time-left-over-we-will-read-comics thinking is as wrongheaded as teaching anything else in isolation. As adults, we do not encounter mathematics in a vacuum; rather, we deal with mathematics (and other subjects) as it comes, infused in our everyday walk through life. The use of comics, I maintain, should be implemented into the classroom in authentic and natural ways when possible. I take this same approach in my technology classroom – intertwining classroom standards into technology so that students study technology in the same manner they might encounter it in the real world. This brings us to a recent lesson I taught to my second graders. Rather than simply practicing skill-and-drill exercises in my K-4 Technology Lab, I create more interesting technology lessons that are also connected to the grade level classroom standards. The second graders in my building (approximately 100 of them) finished with a multi-day lesson using comics and technology, and emphasizing the specific skills of typing, clicking, dragging, highlighting (which I refer to as “click-drag-let go”) blogging, creating, analyzing, reading and writing. Did you catch those higher order thinking skills in that list? First, I use my interactive white board to access Professor Garfield (review forthcoming) and bring up the comic OTTO’S ORANGE DAY published by the incredible Toon Books. We do a picture walk, access our prior knowledge, and make predictions. I then send the students to their individual computers where they read OTTO’S ORANGE DAY. As a matter of differentiation, the site offers the option of having the book read to you. I allow my students to chose that option if they need or want to. Some do and some do not. Others read the book twice, using both strategies. Each student is also reading the book at his or her own pace. What did you dislike about the story? We then use a graphic organizer program on the computer and create our own web. I really enjoyed Otto’s Orange Day. I loved Otto’s funny song. I thought his use of rhyme was very clever. The genie was very mischievous and I liked that. I recommend second grade teachers buy this for their students. Notice the use of juicy words (adjectives). I encourage students to create deeper, colorful sentences, which relates back to the classroom standards. After they finished writing their book review, we posted those comments on our classroom blog. For obvious safety concerns, the students are not allowed to post personal information on the web. Therefore, they have all created their own Super Hero Secret Identity to use when we post on the Internet. It meets the national technology and eMINTS standards of sharing and collaborating with a wider audience beyond the classroom. Parents, teachers, school districts, librarians, and other students can see what our students think about this book. It allows the grade level teacher the ability to assess how their students apply writing skills in other situations outside the classroom vacuum and without teacher intervention. This gives the classroom teach another assessment and helps them make decisions about what writing conventions (spelling, capitalization, punctuation, graphic organizers, etc) to focus on. It also helps us see how students might perform on a constructed response during a standardized test. It serves as a legitimate form of publishing, which is authentic and gives the students a purpose for learning. It promotes numerous technology skills without skill-and-drill. The students had to toggle between Word and Blogger, cut-copy-paste, right click for spelling corrections, locate letters on the keyboard, gather information online and synthesize an opinion about it and others. OTTO’S ORANGE DAY was an excellent tool for meeting the curricular goals of both the Technology Lab and the grade level classroom. This particular assignment was not an exercise in spelling, nor was it a culminating event. Therefore, I did not require proper spelling. I simply instructed the students to do their best. I wanted to assess their ability to write outside the classroom environment without teacher intervention. 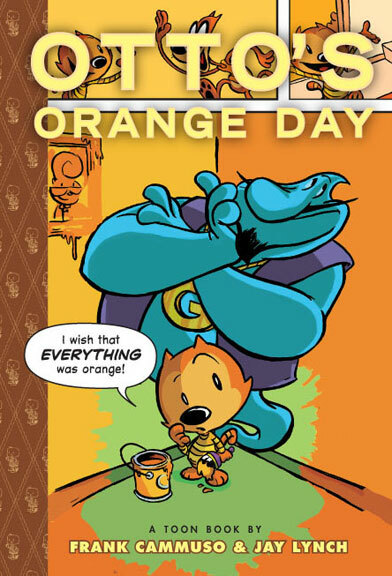 Following is a diverse selection of responses to OTTO’S ORANGE DAY, published on my second grade technology blog, 2ND TO NONE. Publishing at The Graphic Classroom was also a part of the lesson, and meets our technology standard to communication outside the school community. Those student reviews are categorized by day, exactly as the students published them including their super hero secret identity. I did not like the genie. The genie is mean. Otto wished for the world to be colorful again but he made the world blue. The book was just okay. I thought Otto’s Orange Day was fabulous. I liked how the genie wanted pacific words. I thought that the song was funky. I also loved how Otto was coloring the future. I recommend that teachers should get Otto’s Orange Day. I liked Otto’s Orange Day because it rhymes. I liked how the genie got what he wanted. And I liked that he changed all the colors back to their normal colors. You should buy this to read to your student because it is really good and it’s really nice. I liked it and you might like it too. She liked the book Otto Orange Day. He did not like the book. She thinks it is awesome. It is pretty because it is funny. He thinks its lame. It is not funny. She what teachers should buy the book Otto’s Orange Day. He says Nobody should buy the book. I recommend otto’ s book for my teacher . I liked win the jenny because it was very funny popt out of the cup . I think it was funny . I think the teachers shod buy otto,s book. I thenk techer,s shud buy Ott,s orag day because it is vary funny. I really, REALLY liked Otto’s Orange Day! I think you will like Otto’s song the very best out of the whole book! You will love Otto’s song! Your students will love this book- so why don’t you buy it!? I thought the genie was awesome because he was tricky. I liked the genie’s necklace. I highly, HIGHLY recommend this very, very funny book! I loved Otto’s Orange Day!! Otto’s song was hilarious and awesome. Otto is awesome and crazy. 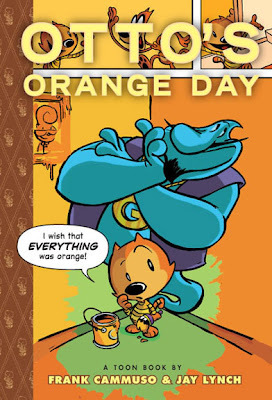 I loved Otto’s Orange Day so much I want to read it every day. I recommend parents to read this book. I like Otto’s Orange Day because it was funny. I liked Otto’s song. I liked when his mom takes his popcicle. I like how the genie was sneakie. I recommend this book for all people who likes books. I like Otto’s Orange Day I liked Otto’s cool color. I liked Otto’s sweet song. I liked the genies super cool color. I think kids should read this book. I like odos orng sog.i like the bling bling. recom mend this book for all 2 grade students. The writing of the book is top notch, incorporating song, rhythm and rhyme. The art was easily accessible to students and the story caused a bit of drama eliciting real responses from the students. The students and I Highly Recommend OTTO’S ORANGE DAY for ages 7 and older. Click here for the publisher’s lesson plans.